Nature published a great new reconstruction of global temperatures over the past 2 million years today. Snyder (2016) uses 61 temperature reconstructions from 59 globally diverse sediment cores and a correlation structure from model simulations of the last glacial maximum to estimate (with uncertainties) the history of global temperature back through the last few dozen ice ages cycles. There are multiple real things to discuss about this – the methodology, the relatively small number of cores being used (compared to what could have been analyzed), the age modeling etc. – and many interesting applications – constraints on polar amplification, the mid-Pleistocene transition, the duration and nature of previous interglacials – but unfortunately, the bulk of the attention will be paid to a specific (erroneous) claim about Earth System Sensitivity (ESS) that made it into the abstract and was the lead conclusion in the press release. The paper claims that ESS is ~9ºC and that this implies that the long term committed warming from today’s CO2 levels is a further 3-7ºC. This is simply wrong. The Snyder (2016) reconstruction of global temperatures compared to Antarctic ice core temperature and CO2, and deep water temperatures. I recently posted a summary of why you can’t constrain ‘Earth System Sensitivity’ (the long term response of the climate system, including ice sheets, vegetation etc.) just by looking at the regression between the forcing from CO2 (and other greenhouse gases) over the ice age cycles. That regression has been looked at before, and Snyder (2016) updates that with her new (and slightly higher amplitude) temperature reconstruction. Unfortunately, she then associates this regression with the Earth System Sensitivity (which it is not) to get a value of ~9ºC for a doubling of CO2. In the previous post, I outlined how the combination of carbon cycle feedbacks to the Milankovitch forcing and the climate system response to CO2 gives rise to this correlation and that – by itself – it can’t be used to define the latter term. Furthermore, because the regression is being defined over ice age cycles where the biggest changes are related to the (now disappeared) North American and Fenno-Scandanavian ice sheets, the regression might well be much less for situations where only Greenland and West Antarctica are “in play”. So, what do we think the ESS is, and how does that impact our view of committed warming today? There have been a few papers on this; Hansen et al (2008), Lunt et al (2010) and Palaeosens (2012). They have focused on looking at the warmer climates of the Cenozoic (the Pliocene, etc.) to avoid the confusion from the response of ice sheets to orbital forcing during the ice age cycles of the Pleistocene, but obviously have significant uncertainties due to less precision about ancient greenhouse gas levels. The ESS values range from about 4.5ºC to 6ºC for a doubling of CO2. One other study came up with substantially higher numbers derived from the PETMPliocene CO2 (Pagani et al, 2010), but a number of assumptions made there limit it’s applicability to today’s climate. The current energy imbalance (just a little less than 1 W/m2) implies that the planet would need to warm by ~ 1 x S / 3.7 ºC to restore an equilibrium, and using the standard climate sensitivity of 3ºC for a doubling of CO2, implies a committed warming of 0.8ºC or so. To leap from that to the claimed 3-7ºC warming requires that the changes in the ice sheets and vegetation arising from the current and (medium term) committed warming would increase the radiative imbalance by another ~2 W/m2 – and that is extreme (for reference, the changes between the last ice age and now from these factors is only about 4 W/m2 (Kohler et al, 2010) with the huge impact of the N. American and European ice sheets included). Thus, Snyder’s claim of a committed warming of 3-7ºC is based on an incorrect method for defining ESS, an inappropriate application of this to the present and is inconsistent with current estimates of the radiative imbalance and plausible future changes in ice sheets. For clarification, this is not an argument about what ESS is, nor is it a claim that we should ignore the long-term responses of the system to current forcing, nor does it mean that paleoclimate has nothing to tell us about future changes (au contraire!). The objection I have is only to this very specific calculation and its subsequent application. I don’t want to speculate on how this situation can have occurred. However the maxim that “extraordinary claims require extraordinary evidence” suggests that it might have behoved the editors to require further checks of such a dramatic statement before going to press. As it is, many will claim that this is yet another example of a high profile journal going for press attention over rigourous science. The net result of the conflicting media reports and criticism will likely be a greater confusion about the relevant science, and an overshadowing of what is at heart a good contribution to understanding climate history and that is a shame. The paper is based on the false logic that historic temperature changes are caused by changes in CO2 concentration. They CAUSE changes in CO2 concentration. The sensitivity of surface temperature to CO2 change is about 1.84 K for CO2 doubling. To achieve CO2 doubling by increasing the global temperature is about 8 K. The claimed 9 K ESS, when treated with the factor 1.84/8 becomes 2.1 K – much nearer the accepted value for CO2 driven sensitivity. The Snyder study uses a selection of ocean cores from the much greater number collected over the past several decades. The curve she finds for gradual cooling leading up to the mid-Pleistocene transition to stronger glacial-interglacial oscillations provides a nice high-resolution record, qualitatively similar to previous studies. Snyder also uses the inferred record of global temperature to estimate equilibrium climate sensitivity including slow feedbacks, sometimes called ESS, suggesting that doubled CO2 (4 W/m2 forcing) would eventually cause global warming of 7-13C. That would be pretty bad news for future generations, if we are so foolish as to continue to pump fossil fuel CO2 into the air at a high rate. Snyder’s empirical inference of climate sensitivity, using the magnitude of the global temperature oscillations, depends especially on the selection of data records. The essentials of the climate sensitivity story can be boiled down to finding the single best-documented glacial-interglacial oscillation. So far, that is the oscillation form the LGM (Last Glacial Maximum, 20,000 years ago) to the Holocene (present interglacial period, 11,700 year period that we live in). Snyder’s study and that of Schmittner et al (Science, 24 November 2011 Science Express) provide bookends to the estimated LGM-Holocene temperature change. Schmittner et al use a spatially more complete data set than Snyder and finds LGM-Holocene warming = 2.3C. Snyder finds LGM-Holocene warming = 6.2C. We have estimated from a range of different observations aided by modeling, that the LGM-Holocene warming is 4-5C, which led to our estimate of ESS sensitivity ~6C in our 2008 paper, which she references. In our 2013 paper, which she also references, we conclude that the fast-feedback and ESS sensitivities are probably somewhat on the high side of the earlier estimates, but we do not give exact values. Instead we discuss observations needed to allow greater precision. The analysis of Snyder emphasizes data covering a substantial period, rather than complete global coverage with well calibrated data for a well-observed glacial-interglacial transition. The longer data set of Snyder does not bulwark her climate sensitivity estimate, because her entire curve should be multiplied by the scale factor determined by the best documented glacial-interglacial transition. This scale factor defines the bias introduced by a particular selection of ocean cores, failure of that distribution to represent a true global average, and various assumptions in converting the proxy data into a temperature change. There are various technical issues with both Schmittner and Snyder approaches that lead them toward their low and high values. Suffice it to say that I expect the true answer lie between the two, but closer to Snyder’s. The evidence favors a temperature change in the range ~4-5C for LGM-Holocene, and thus a fast-feedback climate sensitivity close to 3C or a bit larger. This then leads to an ESS sensitivity ~6C or somewhat higher as discussed in our 2013 paper. Its a useful paper, but disappointing in that it does not point out the need for the scientific community to focus on getting a precise measure of the glacial-interglacial global temperature change. A little strange that she does not mention the Schmittner et al paper, which includes some of the top paleoclimate researchers. Also there should be a recommendation of what needs to be done to make more progress on accurately defining climate sensitivity — there has been little progress in the past few decades. In our 2013 paper, we recommend a concerted attempt to determine the magnitude of the glacial-interglacial temperature change, suggesting that the penultimate glacial-interglacial change (going into the Eemian) would have some advantages over LGM-Holocene, because humans probably influenced the Holocene. At any rate, it would be worth doing both of these last two transitions very carefully. I sometimes wonder if anyone really reads my papers. Gavin, RCfolks, PLEASE heavily moderate this discussion. Bring the scientists in. AJ: Does that include the 0.5C? committed warming via aerosol reduction? RESPECT to James Hansen for everything he has done for climate science and for what he is still doing for the youth of planet Earth! One thing is certain: the clean energy revolution must be ramped up like the Manhattan Project. Our planet depends on it! We need more hockey sticks? Fig. 1. Global surface temperature relative to 1880-1920 based on GISTEMP analysis (mostly NOAA data sources, as described by Hansen, J., R. Ruedy, M. Sato, and K. Lo, 2010: Global surface temperature change. Rev. Geophys., 48, RG4004. We suggest in an upcoming paper that the temperature in 1940-45 is exaggerated because of data inhomogeneity in WW II. Linear-fit to temperature since 1970 yields present temperature of 1.06°C, which is perhaps our best estimate of warming since the preindustrial period. I read your papers too Jim! Clarification… “Current energy imbalance of 1 W/m2…” ??. Fig. 8.15 in AR5 suggests 2.3 W/m2. What’s my mistake? I can’t understand why the journal’s reviewers didn’t smell a problem here. Denialists will make sure we never hear the end of it. Are the committed temps mentioned (0.8C, 3-7C) relative to pre-industrial, to today, or to some other base? Given that we’re probably already at 1.2C over 1750 pre-industrial, I assume the 0.8C figure is additional (from today on) but not sure about the 3-7C prediction of Snyder. Some of the popular press articles have cited Snyder as indicating that we are at the warmest point in the last 120,000 years (i.e. since the Eemian). Not sure what the basis for that claim is. Marcott calculated that perhaps as many as 28% of Holocene years (presumably all 5-10K BP) were warmer than the 2000-2009 decade. Of course, this year could end up being 0.3 K warmer than the average for the last decade. Can we estimate how hot was the warmest year of the Holocene (so far!)? Or, how many years so far have been warmer than 2016 is projected to be? I realize that there is no intrinsic importance to this statistic but it would be a wake up call when we surpass the (estimated) record. Consistent definitions are critical. When someone says that we’ve had 0.8C warming and 1.5C is safe, then folks calculate that we’re only half way there, so there’s no reason to stop gorging yet. But that’s like saying, “We started in New York and Hollywood is Hell, so we can only travel 2999 miles. Thus, to measure how far we are on the journey, let’s use Kansas as the zero-mile marker.” Dorothy wouldn’t approve. 1.3C is awfully close to the 1.5C “safer” guardrail, eh? Add in the aerosol reduction which would result from stopping fossil fuel burning, and we’re awfully close to the 2C “grabbing a tree branch as you go off the cliff” guardrail. ENSO gives us a bit of a respite, but “in the pipeline” (as Robert and Gavin point out) of 1W/m2 out of 2.3W/m2 takes that respite away. I also have read your papers and respect your substantial scientific contribution. You say that the essentials of the climate sensitivity story can be boiled down to finding the single best-documented glacial-interglacial oscillation, at that so far that is the LGM (Last Glacial Maximum) to Holocene oscillation. I would like, if I may, to draw your and other people’s attention to the fact that modern estimates of the change in forcing from the LGM to preindustrial Holocene point to (Charney) ECS being substantially below 3 C.
Kohler et al. 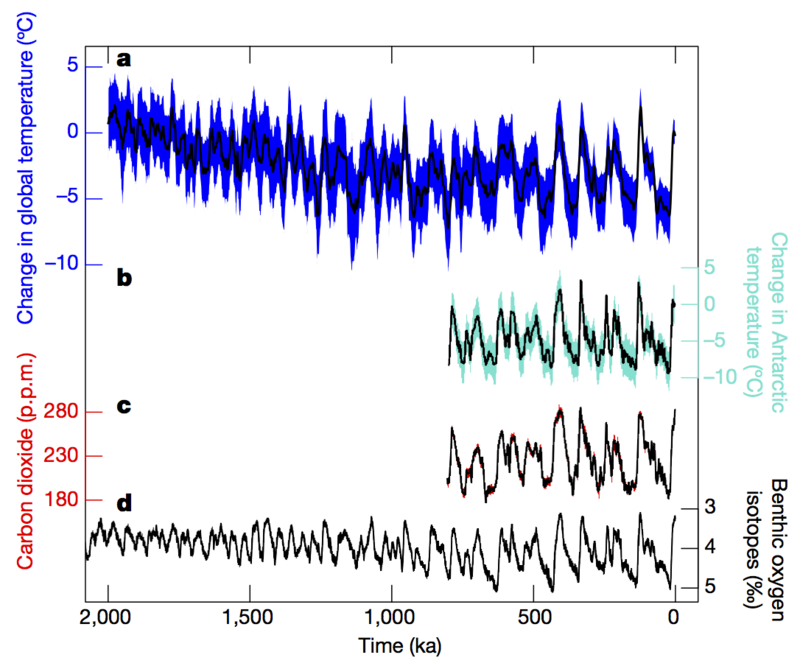 (2010; doi: 10.1016/j.quascirev.2009.09.026) estimate total forcing at the LGM to be –9.5 W/m2 relative to preindustrial, with Gaussian uncertainty having a standard deviation of between 0.9 and 1.9 W/m2. Taking the midpoint of your 4–5 C range for the change in global surface temperature between the same periods, and the 3.71 W/m2 best estimate for forcing for a doubling of CO2 adopted by the IPCC and used by Kohler in calculating the forcing change, this implies an energy-budget best estimate for ECS of 4.5 * 3.71 / 9.5 = 1.76 C.
Using instead the 4.0+/-0.8 C warming estimate from the Annan and Hargreaves (2013; doi:10.5194/cp-9-367-2013) global reconstruction of temperature changes at the LGM implies an even lower ECS best estimate, of 1.56 C.
Taking both the upper limit of the 4–5 C warming range and a lower limit for the forcing change, deducting Kohler’s 1.9 W/m2 upper limit of uncertainty from the 9.5 W/m2 change in forcing , implies an upper bound for the ECS estimate of 2.44 C.
I somewhat agree with Jim Hansen and think that the bigger issue is the large temperature changes reconstructed. In my opinion the best LGM global mean temperature reconstruction is Annan and Hargreaves (2013, http://www.clim-past.net/9/367/2013/), which uses a much larger dataset than Snyder. Their result is a 4 degree C cooling (plus minus 0.8 deg C). I’m very surprised that Snyder didn’t even cite that paper. In her discussion of the LGM temperatures in the Methods section (Validity testing the GAST reconstruction using particular points in time) only studies are considered that agree more with her reconstruction. This seems like a major omission to me. In response to Jim Hansen’s comments I would like to note that our 2011 paper (Schmittner et al., 2011, http://science.sciencemag.org/content/334/6061/1385), which was also not cited by Snyder, did not claim to be the best LGM global mean temperature reconstruction. The main point of that paper was that very high climate sensitivities could be excluded by the LGM temperature reconstructions and I still think that this is a robust and important conclusion. If Snyder’s ESS estimate of ESS_Snyder = 9 deg C is scaled by the ratio of Annan and Hargreave’s to Snyder’s LGM temperature estimate 4/6.2 it results in ESS = ESS_Snyder*4/6.2 = 5.8 deg C a value more in line with previous work. Wow, wishful thinking by Nic Lewis on low ECS, given that we’re at 1.3C (1.8C without aerosols) on a 40% increase in CO2 (though more for CO2e). Anyway, just wanted to ask about the human (and other species) consequences of an ESS of 4.5C to 6C, versus an ESS of 9C. Should we (on behalf of future generations) be relieved that 9C is almost certainly far too high, and future generations might only get 6C (or even 4.5C)? The GAST reconstruction has surprisingly small uncertainties (2-sigma range of +-1.8C at the LGM). The two obvious contributors to the uncertainty are the structural biases in the proxies and the sampling error from estimating GAST from 5-61 SST observations. Structural bias uncertainty estimate comes from three independent proxy types, each with a 2-sigma of 3C, so the 2-sigma on the mean is about +-1.7C. Combining in quadrature suggests a 2-sigma uncertainty of +-4.4C for the LGM uncertainty, which doesn’t seem ridiculous for a reconstruction based only on SST proxies – bigger than the AR5 estimate of +-2.5C, but that estimate is based on much more data. How do we get an uncertainty of +-1.8C – where is the precision coming from? Most papers I read on this show an increasing ESS value as globally averaged temps increase, with some indication of ESS values of > 8.0 during Eemian peak (see PALEOSENS paper 2013 doi:10.1038/nature11574 ). Since this temp reconstruction extends back to the mid-Pleistocene, it seems not appropriate to use LGM-derived ESS values as bookends. The Lake El’Gygytgyn temp recon shows +8C from todays values at 400 ppm CO2 (we are at 485 ppm CO2e now). Obviously, we are currently in transition and our global atmospheric cell structures are going to shift rapidly with broadly expanding Hadley cell and collapsing Arctic cell leading to meridional migration of average cloud cover and reduced albedo. I’ll take a crack at bridging the gap between Schmidt and Hansen/Snyder estimates of ESS. I think of the Hansen approach as envisioning a multidimensional phase space of long-term radiative forcings. The dimensions include noncondensing greenhouse gases, dust/aerosols, ice sheets, and vegetation. (Others can be included; the logic doesn’t change.) Most of these can be forcings at long time scales: GHG due to anthropogenics, sustained volcanic activity, or weathering; dust/aerosols due to sustained volcanic activity; and ice sheets due to orbital variations. If a forcing mechanism is not operating along a particular dimension, that dimension serves as a feedback. The Hansen method requires the following two statements to be true. 1. If a particular forcing has a particular value, there is a single equilibrium state for the earth system with particular values for the other three feedbacks. This is plausible, since these feedbacks are tightly coupled to global temperature and to each other. This gives a single four-dimensional state vector for the radiative contributions from the forcing and feedbacks, given a particular forcing. 2a. (technical language) The earth system is sufficiently well-behaved and coupled that the set of all possible four-dimensional equilibrium state vectors forms a smooth, monotonic manifold. This implies that the state vector is the same state vector no matter which dimension is serving as the forcing. 2b. (non-technical language) In other words, if you know the value of the radiative contribution from one of the factors, you can immediately determine the radiative contribution from all the other factors, since they are all coupled. Most importantly, it doesn’t matter which contribution is playing the role of the forcing. If 1 and 2 are true, it’s a simple matter to compute the ESS to GHG based on the last glacial cycle because you’re going from one equilibrium combination of ice, dust, vegetation, and GHG to another, and it doesn’t matter what processes got you there. One implication of this would be that the ESS is heavily forcing-dependent. It matters whether the forcing agent is GHG or tectonic activity or orbit-driven ice sheet changes. If a large change in energy balance due to ice sheets produces a small change in energy balance due to GHG, then conversely a small change in energy balance due to GHG must produce a large change in energy balance due to ice sheets. The ESS to GHG would be much larger than the ESS to ice sheets. For Gavin, this is a bug; for Jim, this is a feature. Problem #2: Was the climate system in a sufficiently equilibrated state during the LGM (or in any prior glacial or interglacial period) to define the four-dimensional equilibrium manifold uniquely? The ice sheets exhibited unstable behavior, modulated by orbital cycles, so how close was the climate system during the LGM to its equilibrium state on the manifold? Most previous interglacial periods were brief and do not seem to have had sustained steady temperatures, so they may not work well either. We’re on safer ground during the period 30MYA to 3MYA, before the large swings in ice cover began taking place, but then estimates of global temperature are much less precise. May I ask, what is the evidence for this, that variations in aerosols are predominantly a consequence of fast feedback processes? Naively, for example, I can imagine slow changes in vegetation leading to variation in the availability of dust & other aerosols. You refer to Pagani et al 2010 as based on PETM-data, but I see only Pliocene-data. Am I missing something? Their figure 5 shows the pdf’s of climate sensitivities. 5a shows the Pleistocene climate sensitivity (for surface T) against CO2 only, which is about 2 °K/(Wm²) (median value). The Pliocene climate sensitivity (5b) is about 1 °K/(Wm²). When they regress using the CO2-forcing and the ice-albedo forcing they get about 1 °K/(Wm²) for the Pleistocene climate sensitivity (5c), about the same as for the Pliocene climate sensitivity (5d). They conclude that once all feedbacks have played out for future CO2 doubling ESS will very probably (95% confidence) be smaller than 5.2 °C. That seems quite a contrast to me with the statement in the abstract of Snyder. Or am I missing something here? Also: Rohling is co-author of Martínez-Botí et al. and reviewer of Snyder 2016. Was the abstract of Snyder et al. written after the review process? Thank you for this helpful post, Gavin. Just one small question: Am I right that the equation should be ~1 x S/3.7 W/m2 (rather than ~1 x S/3.7˚C as written), with 3.7 W/m2 representing the RF of a doubling of CO2? Re#16 and those temperature reconstructions the green line (Hanson et al) the temperatures seem far too high. In the Cretaceous and soon after the planet would surely have been to hot to support complex life, especially large vertabrates if they were true. I don’t think you can assume that. We know that tropical creatures inhabited high latitudes during various hothouse episodes, so the possibility exists that a large chunk of the 14 C deltaT was in temperate and higher latitudes, with the tropics only modestly warmer. Indeed, physical theory would lead us to expect just that, with a relatively stronger greenhouse effect decreasing latitudinal temperature gradients. typical news report on this paper. Prominent climate scientists have issued a warning that a paper published in the influential journal Nature sensationalised climate change predictions and used an “incorrect calculation”. But that prediction has come under fire from prominent climate scientists, including Dr Gavin Schmidt, a climate scientist and director of the NASA Goddard Institute for Space Studies. He said he did not think the conclusion was correct. imo Aussie news are paying attention to Gavin now because he intervened in the Cox Roberts Q&A debacle and called a spade a spade. “The people” need even more Gavinses intervening in topical current news stories connected with climate change politics and media disinformation via Twitter and Facebook etc. Gavin, thank you for a good and informative post, and responses to the commenters. AJ: We’re not existentially concerned about what happens when ice sheets in currently temperate regions melt, but what happened as the Eemian approached peak. Perhaps that period deserves special attention? 280-300PPM at Eemian peak? Why was it warmer back then? As you noted, humans might have influenced the Holocene. Perhaps that isn’t a reason to exclude the Holocene, but to extrapolate into the Anthropocene.